External USB with built-in charger cable offers a convenient charging by connected with your electronic device. 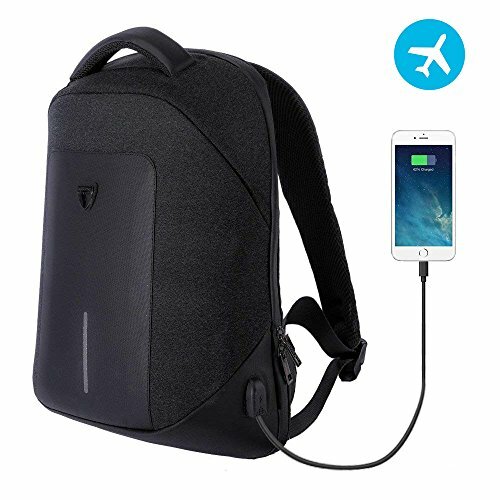 Made from durable nylon fabric and featuring a reinforced bottom ,which is Light-weight Carrying and perfect for business traveling, weekend getaways, school, shopping and other outdoor activities in daily life. Anti-theft protections: The zipper/pockets are fully hidden which protects your wallet/laptop/smart phone/others inside backpack away from thief. Fashionable Design: Made of water resistant durable fabric and ergonomic design of S-shape padded shoulder straps and padding back design protect the back and shoulder effectively. The end to end zipper make the backpack can be opened 180 degrees. External USB Charging Design: Convenient to charge smart phone/tablet/other devices without opening up the backpack. After sale service: If you have any questions, please feel free to contact us. We will do our best to offer a satisfactory solution. Package include: 1 Travel Backpack with a double head USB line (without Battery and Power bank). Product Dimensions: 12" x 5.2" x 18" fits 15.6 inch notebook. Weight: 2.2 lb. If you have any questions about this product by Konduone, contact us by completing and submitting the form below. If you are looking for a specif part number, please include it with your message.